Ooh la la! If you happen to be a Francophile, here’s a book for you. Even if you’re not, well, if you like your more contemporary illustrations — bright spins on busy, urban settings — Sarah McMenemy may be just for you. This is one young girl’s trip to Paris with her parents, rendered in simple rhymes from Kimmelman: “When in Paris . . . everybody bonjours. From shores. In stores. On guided tours. Everybody bonjours!” And we’re talking a few words on each page or double page spread. The young girl, out and about in the city, hits all the major tourist hotspots: the Latin Quarter, the Louvre, Notre Dame, the Tuileries Gardens, and much more, the book closing with a guide to each major landmark and a bit of enthused information about it, explained in terms the youngest of preschoolers will understand (“Notre Dame cathedral is a church that took 200 years to build!”). The endpages provide a compressed map of the landmarks the girl sees — and on a cool blue palette. Observant children will have fun spotting Monsieur LeMousie on each spread. McMenemy — whose work has been commissioned for such things as brochures for Toyota, installation pieces for the London Underground, and posters for the New York Hudson River Festival — debuted as a children’s book illustrator with 2003’s Waggle. Her mixed media illustrations are rendered in the boldest shades and convey the joy and wonder the young girl feels in this new city, doing things as mundane as chores to eating petits fours. In the end, she’s happy to be home in the arms of her grandmother at the airport. 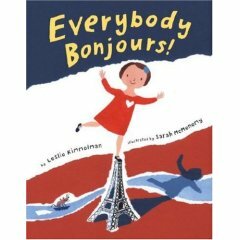 This would make an excellent read-aloud, particularly for units on Paris or travel, it goes without saying. McMenemy’s art resonates with a vibrancy and contagious energy. Très bien. Cute is hard. Picture book cute, that is. A lot of people might disagree with that, but I’m going to make a case here. There’s a perception out there that if you slap a pair of big brown eyes and a furry tail on something, badda-bing! Instant adorable. Picture books, however, offer the greatest test any author or artist has to face. Because cute isn’t just a visual state. It’s reliant on a story that can be touching without becoming candy-coated and saccharine. It requires a certain level of restraint on both the author and the illustrator’s part. Cute is hard to do and do well. Like I say, anyone can fake it and end up on a line of greeting cards, but very few people can make cute count for something. Bonny Becker can. 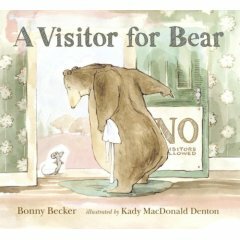 With her remarkable A Visitor for Bear, Becker teams with top notch illustrator Kady MacDonald Denton to bring us a book that actually goes on beyond “cute” into something more. This is a book that warms the cold cockles of even the grumpiest heart. People who cringe at the sight of Bambi and shudder at baby chicks will be instantly charmed by Becker and Denton’s tale of a grump that learns that sometimes the right visitor is worth the vexation that comes with giving up your privacy. “No one ever came to Bear’s house,” the book opens. He even has a sign: “NO Visitors Allowed.” One morning, however, after Bear has just gotten up — his look rivalling that of Grumpy Bird’s in the morning — a mouse, “small and gray and bright-eyed” is at his door. Telling him to go away, Bear sets out to complete his morning routines with apparent glee. This is a bear who actually likes being alone. The mouse keeps returning in various and sundry creative places — the cupboard, the bread drawer, the egg carton in the fridge, etc. Eventually, Bear gives in — with tears — and asks him if he’ll just leave after he indulges him with a bit of cheese, a cup of tea, and a nice fire at the chimney. Grudgingly, Bear gets the spot of tea and the cheese ready, only to sit down and discover that he enjoys his talk with the mouse (“The mouse looked most attentive. No one had ever been most attentive to Bear.”) When the mouse starts to excuse himself, Bear begs him to stay, eventually ripping up his “NO Visitors Allowed” sign. There’s a lot of humor here: Bear’s manner of speaking (“Away with you! Vamoose!” and his roar of “BEGONE!”); Denton’s no-holds-barred high drama (the spread in which Bear discovers the mouse in the fridge and leaps into the air, yelling his “BEGONE!” is classic); and the entirely endearing moment in which Bear’s heart starts to thaw and he realizes that perhaps he can get something out of friendship after all (Bear is suddenly on the floor during this moment, randomly sharing an accomplishment, as children are wont to do: “‘I can do a headstand,’ said Bear. ‘Very impressive!’ exclaimed mouse”). This is a classy tale of friendship that doesn’t bang us over the head with a Message About Friendship, and Denton’s very autumnesque-hued watercolor, ink, and gouache illustrations, spilling to the edge of every spread, greet us at the door and welcome us in with ease and warmth to Bear’s detailed, cozy world. It is remarkable the world that both Becker and Denton create with an economy of words and line, including vivid characterization. This is a picture book at its finest, one that both aspiring picture book authors and illustrators can study to see how it’s done, friends. A delight on every level. And Adrienne at WATAT gets the Psychic Brain Twin Award for emailing me on the same day I first read this book — and had already fallen hard for it — and saying, have you seen this wonderful book? Great minds think alike. 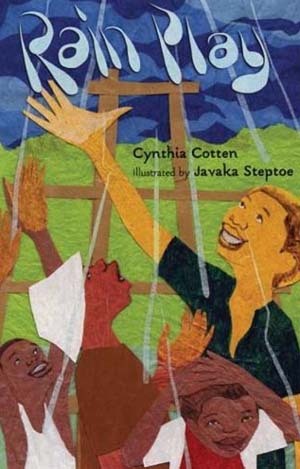 I love Javaka Steptoe’s cut-paper collage illustrations, and he delivers again in this new title by Cynthia Cotten, which celebrates the simple delights of playing in cool rain water at the park. Cotten’s sing-songy text is delivered in short, staccato rhyming couplets: “Rain begins. Cools our skins. Raindrops splatter. People scatter.” The meter’s never forced, and the rhymes slide right off one’s tongue, making this a good choice for story times, particularly ones about the seasons and, in particular, rain. Steptoe’s illustrations brim with life, picturing an exuberant group of children who make the most of getting caught in the rain. Occasionally playful with perspective and using the richest, deepest blues and sunniest yellows — this is no timid palette here — he draws the reader in with his texturized paper collages and swirling movement. The faces of the children playing in the summer rain are painted on, which is a nice juxtaposition to the cut paper that forms the rest of them — and allows for more detail, Steptoe still managing to convey depth with his shading. 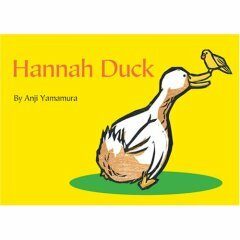 Hannah Duck lives peacefully at home with Gigi the parakeet and KameKame the turtle. Every Sunday she goes for a walk — but has to hide her discontent on those days. She does actually walk to the park, but then she stops at the gate, turns around, and heads home. Her pals, Gigi and KameKame, always grill her upon her return, seeming eager to get out themselves. One day, tired of lying, she admits her fears and hesitation: “‘The truth is . . .’ Hannah Duck started, then stopped. This was hard. ‘I don’t like walks. They scare me. '” When Gigi offers to join her, they head out — to see the pigeons, who end up being very nice; to see the cats, who are also friendly; and to feel the warm sun and nod hello to the crows. Looking up at one point to find Gigi, she sees “the most beautiful sunset she’d ever seen.” And it’s ’cause she was able to lean on a friend that she was exposed to the beauty at all. This is an experience the youngest of children will understand and to which they can relate without hesitation. The illustrations, texturized wood block prints, are the work of Japanese picture book artist Anji Yamamura, who — according to her bio — moved to Tokyo and taught herself the art of wood engraving. I’m not sure how the color was applied to her prints (and am very curious to know), but the entire look of the book — in terms of color and its application — is reminiscent of picture books of the mid ’60s. An engaging, sweet story with a big heart at its center, and I look forward to more of Yamamura’s titles. Well, I had two more titles for this post, but I’ve run out of steam. I’ll save them for a Part Deux. Happy picture-book reading to one and all . . .
Psychic Brain Twin Award! YAY! I love the language in A Visitor for Bear, too. It’s a vocabulary-builder without being all obvious and boring. It’s so important for young kids to hear lots of different kinds of words. Yay, Steptoe and Becker! Two great tastes that taste great together. Thanks for the linky links (and please forgive me for using the term “linky link” which I swear from here on in I shall never say again). Word, Adrienne: “This is impossible! Intolerable! Insufferable!” and “I am undone” — love it. You’re right. Kids are seeing such juicy, great words but not feeling taught-to. They’re too busy laughing. I love Bear’s melodramatic responses to Mouse. Do you know there will be two more Bear and Mouse books? Woot! Fuse, “linky link” is okay with me. It’s fun to say, no doubt. Wonderful reviews. Can’t wait to get my hands on all of them. I should know better than to read your “Picture Book Round-Up” posts–because I always want to buy the books you write about. I know I can trust your judgment because we seem to have the same taste in picture books. All of these titles sound great! I did not know this about Bear and Mouse. I will be very much looking forward to Bear’s further histrionics. A VISITOR FOR BEAR is one of my favorite picture books of the last 12 months. Becker blends wonderful slapstick and subtle shifts in character which is no easy task. 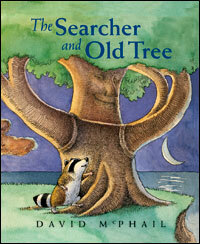 I’m recommending it to everyone, and look forward to reading it aloud to groups of children. I’m told a companion volume is coming. I’ll be first in line to get it.